We want to tell you guys about another really awesome deal that our friends over at Banggood have put together for us. Every week there are new coupon deals that you can find here. These coupon deals mean that you can save loads of money on new parts for your drone (and other items) each week! 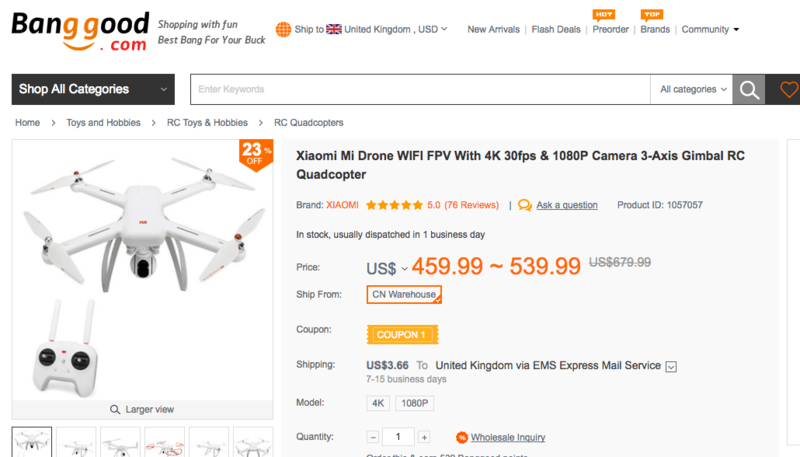 The best deal, in my opinion, is the 20% off the Xiaomi Mi Drone quadcopter. This is one of the best drones on the market that I have reviewed here. It rivals the DJI Phantom but its ultimate selling point is that it is cheaper. Well, you can now save a further 20% on the Mi Drone with the coupon code 68a397 – just click here to see the deal. I recommend you check out this weekly sale. They also sell other things such as phones, watches, lamps and much more. Again, I must thank our friends at Banggood for making all these deals possible. Until next time – happy flying!